[S1605] Image of the 1861 Census for 6 Stratford Place, St. Pancras, London: RG9 Piece 0119 Folio 101 Page 9. [S384] Website FamilySearch Internet (http://www.familysearch.org) : Batch: M047932. 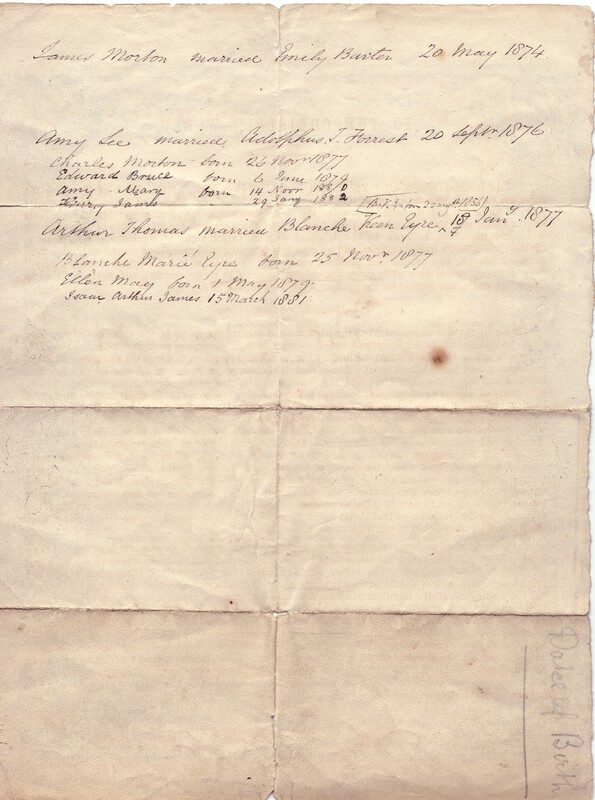 [S2320] A "Family Register", detailing the descendants of James and Ellen Pask née Villiers, kindly provided and transcribed by John Morton Cross in October 2003. John writes in March 2005: "The birth certificate of Isaac Pask identifies his mother, Ellen Villiers, as in fact being Ellen Levy, and in no searches have I found any evidence of an appropriate Ellen Villers. 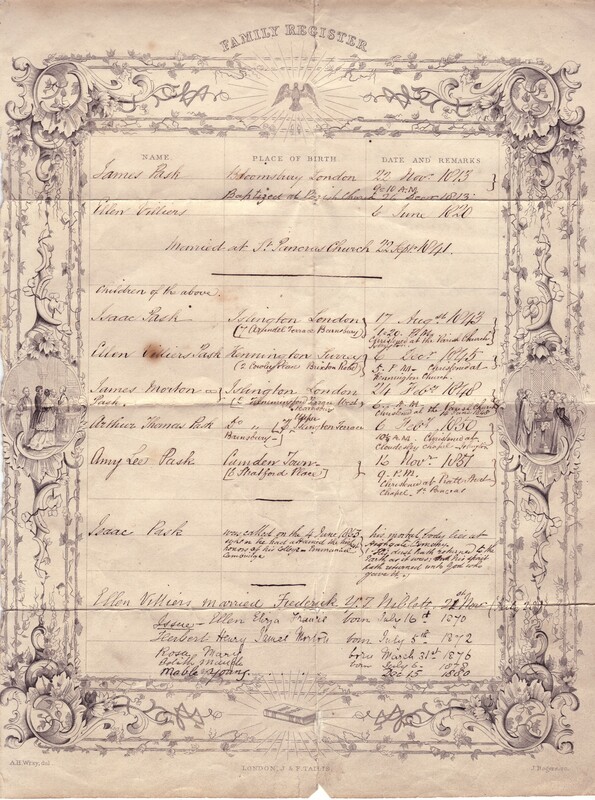 However I have located the marriage certificate of James Pask and Ellen Levy dated September 1841. The reality of Villiers in any of the family names I now feel is questionable" Page 1 and Page 2. [S2761] E-mail from William de Villiers to Stuart & Teresa Pask dated 16 September 2007. [S5544] Image of the 1841 Census : LNDHO107 Piece 660 Folio 28 Page 11. [S2320] A "Family Register", detailing the descendants of James and Ellen Pask née Villiers, kindly provided and transcribed by John Morton Cross in October 2003. Gives date of birth as 6 June 1820 Page 1 and Page 2. [S384] Website FamilySearch Internet (http://www.familysearch.org) : Batch C040803: Birth: 06 JUN 1819; Christening: 02 JUL 1819 Saint Leonards, Shoreditch, London, England Parents Isaac LEVY & Mary COLYER. FHL Film Number: 396233, 396234. 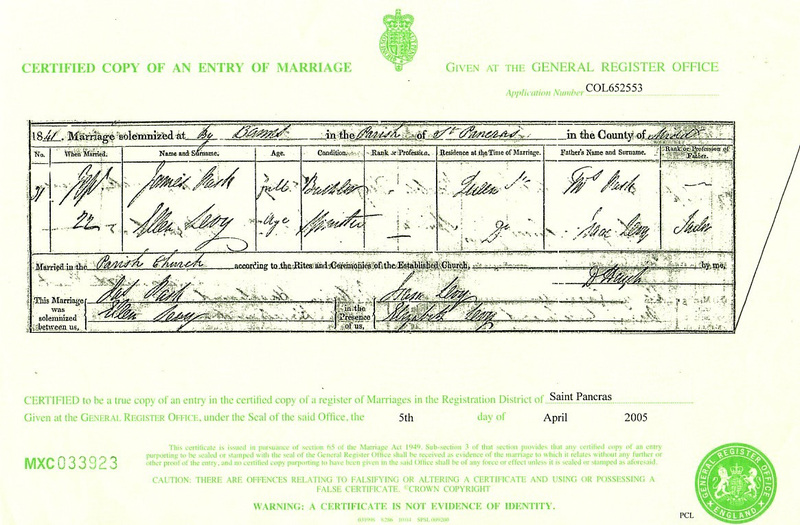 [S2335] Copy of the marriage certificate of James Pask and Ellen Levy, 22 September 1841. Kindly provided by John Morton Cross. [S3] GRO Indexes to Marriages. "1841/Q3 PARK, James Pancras 1 348." [S2293] E-mail from Andrew Millard to Stuart & Teresa Pask St Paul Canonbury, Islington: "1848 June 14, born 26 Feby 1848, James Moreton[?] son of James and Ellen PASK, of Hemmingford Terrace, clerk." [S1839] Image of the 1851 for 66 Stratford Road, St. Pancras, London: HO107 Piece 1498 Folio 115 Page 61. [S1840] Image of the 1871 Census for "Laden Cottage", St. Margaret's, Isleworth, Middlesex: RG10 Piece 1312 Folio 47 Page 38. [S1606] Image of the 1881 Census for Cavendish Road, Willesden, Middlesex: RG11 Piece 1362 Folio 45 Page 25. [S4999] Website UK Government Probate Search Service: The Will of James Pask late of 40 Gascony-avenue Brondesbury in the County of Middlesex who died 15 May 1886 at 40 Gascony-avenue was proved at the Principal Registry by James Morton Pask of the Royal Naval College Greenwich in the County of Kent Naval Instructor and Arthur Thomas Pask of 39 May-grove-road Brondesbury Gentleman the Sons two of the Executors. [S4] GRO Indexes to Deaths. "1886/Q2 PASK, James Hampstead 1a 411 age 72." [S1841] Image of the 1891 Census for Willesden, Middlesex: RG12 Piece 1044 Folio 115 Page 27. [S2319] Image of the 1901 Census for 23 Parkfield Street, Moss Side, Lancashire: RG13 Piece 3671 Folio 162 Page 27. [S4] GRO Indexes to Deaths. "1901/Q4 PASK, Ellen Chorlton 8c 470 age 82." [S4999] Website UK Government Probate Search Service: PASK Ellen of 23 Parkfield-street Moss Side Manchester widow died 26 December 1901 Probate London 11 January to Frederick William Mann solicitor Effects £2583 8s.9d. [S384] Website FamilySearch Internet (http://www.familysearch.org) : Batch: P015571. [S2320] A "Family Register", detailing the descendants of James and Ellen Pask née Villiers, kindly provided and transcribed by John Morton Cross in October 2003 Page 1 and Page 2. On 28 March 1872 James joined the Royal Navy as an Instructor. "Naval Instructors" were introduced into the Navy in 1826 to assist the "young gentlemen" in acquisition of sufficient knowledge to enable them to pass their examinations for Lieutenant. The economical practice of combining the Naval Instructor with the Chaplain died out during the 1914-18 war. Payment to the Naval Instructor of £5 p.a. from each Midshipman's own pay ceased in about 1910 though the order for this was not officially rescinded till 1923. His initial ship was the H.M.S. Druid off the Cape of Good Hope and West Coast of Africa, where he served for three years. On the 30 January 1875, he joined H.M.S. Britannia, a training ship for R.N. Cadets. A few months later on 4 June 1875, he joined H.M.S. Immortalité where he served for two years. In 1877 after a short spell when he did not have a ship, he joined H.M.S. Temeraire on 17 August 1877, and served in the Mediterranean. He left H.M.S. Temeraire on 6 June 1882. On 28 March 1883 he joined H.M.S. Neptune where he stayed only a short while, as on 22 November 1883, he joined H.M.S. President, a drill ship for Royal Naval Reserve at West India Docks, London. On 29 August 1889, he joined H.M.S. Northumberland, the Flag Ship for the Channel Squadron until 9 May 1890, when he joined H.M.S. Howe also in the Channel Squadron. In 1892, on 31 May he joined another Flag Ship for the Channel Squadron, this time it was the H.M.S. Royal Sovereign where he served for two years. On 12 January 1894, he joined H.M.S. Britannia, the training ship for naval cadets at Dartmouth. Whilst serving on the H.M.S. Druid, he took part in the Ashantee war led by Sir Garnet Wolseley that took place in Oct 1873-March 1874. On his return to England, in 1874, he wrote to the British Musuem. the town by the Dixcove river in the last war. I received them on the evening after the battle from his majesty through the commandant. They are cut in the manner you will observe in all probability to serve as drinking cups. The men of Aquidah are of the Ahanta tribe. [S2] GRO Indexes to Births. "1848/Q1 PASK, James Morton Islington 3 297." [S3] GRO Indexes to Marriages. "1874/Q2 PASK, James Morton Brentford 3a 106." [S2315] E-mail from John Morton Cross to Stuart & Teresa Pask Birth Certificate states 24 Feb 1848. [S2478] E-mail from David Noden to Stuart & Teresa Pask dated 6 February 2007: Royal Navy Lists. [S2315] E-mail from John Morton Cross to Stuart & Teresa Pask dated 30 September 2006: On www.pbenyon.plus.com there is a reference to James Morton Pask - The Navy List, Index to Extracts from Various Navy Lists 1844-1879 Surname: Pask, First Names : James Morton, B.A. Date of Navy List - Appointment and date: June 1879 : 485 - Temeraire 17 Aug 77. [S2478] E-mail from David Noden to Stuart & Teresa Pask dated 23 January 2007: 1874, 0528. 1-2 - Drinking cups made from human skulls. Donated by James Morton Pask. In the department's archives in 'Christy correspondence P' is a letter from James Morton Pask to Dr. Gunther. Eth Doc 409 can be viewed by request at The Centre for Anthropology, British Museum. [S3] GRO Indexes to Marriages. "1874/Q2 BARTER, Emily Brentford 3a 106." [S1184] E-mail from Mary Rix to Stuart & Teresa Pask. [S2294] Image of the 1881 Census for "Temeraire", Royal Navy: 1881 RG11 Piece 5641 Folio 17 Page 30. [S2315] E-mail from John Morton Cross to Stuart & Teresa Pask dated 30 September 2006. [S2327] Image of the 1901 Census for 3 Torbay Park, Paignton, Devon: RG13 Piece 2063 Folio 49 Page 26. Indexed incorrectly under the name of RASK. [S2761] E-mail from William de Villiers to Stuart & Teresa Pask. [S4] GRO Indexes to Deaths. "1930/Q1 PASK, James M. Richmond S 2a 709 age 81." [S2761] E-mail from William de Villiers to Stuart & Teresa Pask The Times (29 January 1930), p. 1; (20 March 1930), p. 21. [S2484] Website Pask-Paske Blog (http://pask-paske.blogspot.com/: ) http://pask-paske.blogspot.com/2007/01/…. [S4] GRO Indexes to Deaths. "1934/Q4 PASK, Emily Poole 5a 269 age 87." [S3] GRO Indexes to Marriages. "1847/Q1 BARTER, Emily Plymouth 9 413." [S2] GRO Indexes to Births. "1843/Q3 PASK, Isaac Islington 3 143." [S2320] A "Family Register", detailing the descendants of James and Ellen Pask née Villiers, kindly provided and transcribed by John Morton Cross in October 2003. John writes in April 2005: "Isaac Pask's birth certificate stated Isaac born 20th August 1843 at 7 Arundel Terrace Islington, mother Ellen formerly Levy" Page 1 and Page 2. 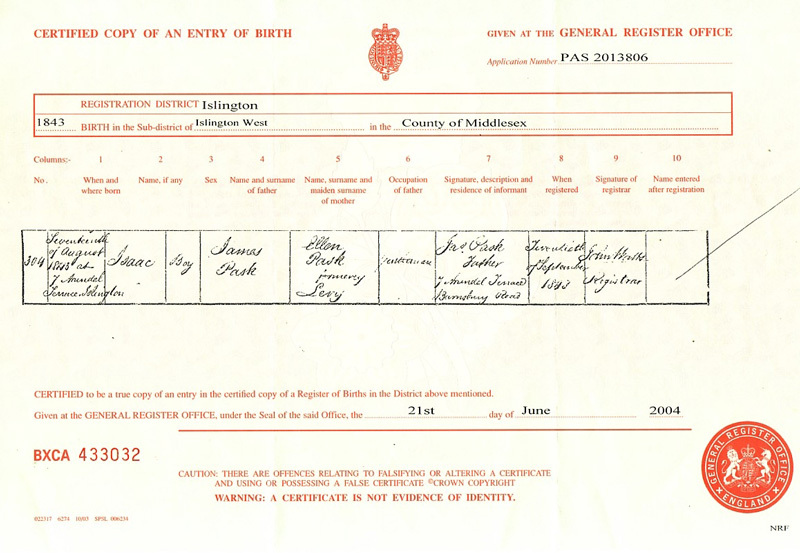 [S2334] Copy of the birth certificate of Isaac Pask, born 27 August 1843. Kindly provided by John Morton Cross. [S2320] A "Family Register", detailing the descendants of James and Ellen Pask née Villiers, kindly provided and transcribed by John Morton Cross in October 2003. states that he was called on the 4 June 1863 when he had attained the high Honors of his College, Immanuel, Cambridge Page 1 and Page 2. [S4] GRO Indexes to Deaths. "1863/Q2 PASK, Isaac Chesterton 3b 309." [S2315] E-mail from John Morton Cross to Stuart & Teresa Pask dated 23 Febraury 2006: Cambridge University Alumni. [S3] GRO Indexes to Marriages. "1876/Q3 PASK, Amy Lee Brentford 3a 112." [S2] GRO Indexes to Births. "1851/Q4 PASK, Amy Villiers St. Pancras 1b 330." [S384] Website FamilySearch Internet (http://www.familysearch.org) : Batch: C047935. [S2315] E-mail from John Morton Cross to Stuart & Teresa Pask Birth Certificate states 16 Nov 1851. [S2320] A "Family Register", detailing the descendants of James and Ellen Pask née Villiers, kindly provided and transcribed by John Morton Cross in October 2003. States that she was christened at Pratt Street Chapel, St. Pancras Page 1 and Page 2. [S3] GRO Indexes to Marriages. "1876/Q3 FORREST, Adolphus Tesdorpf Brentford 3a 112." [S2318] Image of the 1891 Census for 23 Parkfield Street, Withington, Lancashire: RG12 Piece 3163 Folio 81 Page 48. [S4] GRO Indexes to Deaths. "1904/Q3 FORREST, Adolphus T. Chorlton 8c 452 aged 57." [S2315] E-mail from John Morton Cross to Stuart & Teresa Pask dated 29 August 2006. [S1835] Image of the 1871 Census for Bucknall, Lincolnshire: RG10 Piece 3379 Folio 5 Page 4. [S2315] E-mail from John Morton Cross to Stuart & Teresa Pask dated 21 Septemer 2006. [S2316] Image of the 1881 Census for 158 Lloyd Street, Moss Side, Lancashire: RG11 Piece 3940 Folio 117 Page 87. [S2] GRO Indexes to Births. "1877/Q4 FORREST, Charles Morton Chorlton 8c 827." [S2] GRO Indexes to Births. "1879/Q3 FORREST, Edward Bruce Chorlton 8c 756." [S2] GRO Indexes to Births. "1880/Q4 FORREST, Amy Mary Chorlton 8c 830." [S1392] Image of the 1871 Census for Great Livermere, Suffolk: RG10 Piece 1726 Folio 20 Page 8. [S1607] Image of the 1861 Census for Harmston, Lincolnshire: RG9 Piece 2354 Folio 53 Page 7. [S2] GRO Indexes to Births. "GRO Online Index: 1841/Q3 WILDMORE, Walter Dickinson POWLEY Sleaford 14 479." [S314] Parish Registers Transcript, Timberland, Lincolnshire "Marriage: Sarah Ann PASK (SP) age 20 sotp Father Richard PASK labourer = Walter WILDMORE (WW) age 28 botp horsebreaker Father Christopher WILDMORE clockmaker." Baptised 26 July 1846 St. Michael's Church Billinghay. Married 11 June 1872 St. Andrew's Church Timberland. [S5551] Image of the 1911 Census : RG14PN19606 RG78PN1177 RD416 SD1 ED3 SN1. [S5548] Image of the 1881 Census : RG11 Piece 3221 Folio 11 Page 16. [S5549] Image of the 1891 Census : RG12 Piece 2577 Folio 8 Page 8. [S5550] Image of the 1901 Census : RG13 Piece 3047 Folio 48 Page 37. [S4] GRO Indexes to Deaths. "1921/Q1 WILDMORE, Sarah Sleaford 7a 519 aged 68." Sarah Wildmore of High Street Billinghay buried 24 February 1921, age 68 years. [S4] GRO Indexes to Deaths. "1921/Q3 WILDMORE, Walter D. Sleaford 7a 424 aged 80." Walter Dickinson Wildmore of High Street Billinghay buried 15 September 1921, age 80 years. Baptised 15 Sep 1872 St. Michael's Church Billinghay. [S2] GRO Indexes to Births. "GRO Online Index: 1874/Q2 WILDMOORE, Walter Powley PASK Sleaford 7a 446." Baptised 4 June 1874 St. Michael's Church Billinghay. [S2] GRO Indexes to Births. "GRO Online Index: 1876/Q1 WILDMORE, Harriet Ann PARK Sleaford 71 490." [S2] GRO Indexes to Births. "GRO Online Index: 1878/Q2 WILDMORE, Maud Mary PASK Sleaford 7a 491." [S2] GRO Indexes to Births. "GRO Online Index: 1880/Q2 WILDMORE, Annie Florence PASK Sleaford 7a 491." [S2] GRO Indexes to Births. "GRO Online Index: 1882/Q3 WILDMORE, John Willie PASK Sleaford 7a 453." [S2] GRO Indexes to Births. "GRO Online Index: 1885/Q3 WILDMORE, Arthur Polley PASK Sleaford 7a 434." [S2] GRO Indexes to Births. "GRO Online Index: 1887/Q3 WILDMORE, Fanny PASK Sleaford 7a 458." [S2] GRO Indexes to Births. "GRO Online Index: 1889/Q3 WILDMORE, Jenny PASK Sleaford 7a 433." [S2] GRO Indexes to Births. "GRO Online Index: 1892/Q1 WILDMORE, Edward Powley PASK Sleaford 7a 425." Research Note: Birth not found in GRO indexes. [S1552] Transcript of the marriage of Thomas Landsall and Eliza Ann Pask, 29 July 1883. Kindly provided by Marion Harper Hopkins - GOONS Marriage Challenge. [S1614] Image of the 1871 Census for Ancaster, Lincolnshire: RG10 Piece 3361 Folio 70 Page 2. [S3] GRO Indexes to Marriages. "1888/Q3 PASK, Eliza Ann Lincoln 7a 841." [S2] GRO Indexes to Births. "1869/Q1 PASK, John Charles Sleaford 7a 443." [S1615] Image of the 1881 Census for 16 Newark Road, North Hykeham, Lincolnshire: RG11 Piece 3235 Folio 98 Page 16. [S2] GRO Indexes to Births. "1870/Q4 PASK, Albert Grantham 7a 429." [S4] GRO Indexes to Deaths. "1923/Q1 PASK, Albert Grimsby 7a 741 age 52." [S2] GRO Indexes to Births. "1872/Q3 PASK, James Henry Grantham 7a 474." [S4697] Image of the 1911 Census for 114 Newland Street West, Lincoln, Lincolnshire: RG14 Piece 19741 Schedule 163. [S3356] Transcript of the marriage of James Henry Pask and Sarah Elizabeth Mays, 23 April 1896. Kindly provided by Marion Harper Hopkins - GOONS Marriage Challenge. [S1557] Image of the 1891 Census for 23 Princess Street, Lincoln, Lincolnshire: RG12 Piece 2590 Folio 52 Page 14. Indexed incorrectly under the name of PARK. [S3] GRO Indexes to Marriages. "1896/Q2 PASK, James Henry Lincoln 7a 1124." [S332] E-mail from Colleen Morrison to Stuart & Teresa Pask dated 7 June 2018 - 1921 Census Substitute (by The Genealogist). [S4] GRO Indexes to Deaths. "1925/Q3 PASK, Sarah E. Lincoln 7a 474 age 50." [S4999] Website UK Government Probate Search Service: PASK Sarah Elizabeth of 22 Carholme-road Lincoln (wife of James Henry Pask) died 18 August 1925 Probate Lincoln 26 October to the said James Henry Pask builder. Effects £262. Data provider: Lincolnshire Family History Society. [S4999] Website UK Government Probate Search Service: 1942: James Henry of 20 Whitehall-grove Lincoln died 24 August 1942 Probate Lincoln 9 October to Edith Holland (wife of David Holland) and Albert Lowis Shaw solicitors cashier. Effects £2127 6s 3d. [S4] GRO Indexes to Deaths. "1942/Q3 PASK, James H. Lincoln 7a 472 age 69." [S27] Website National Burial Index (NBI) @ FindMyPast (www.findmypast.co.uk: ) 26 Aug 1942 James Henry PASK 69 Lincolnshire Lincoln, Canwick Road Cemetery.